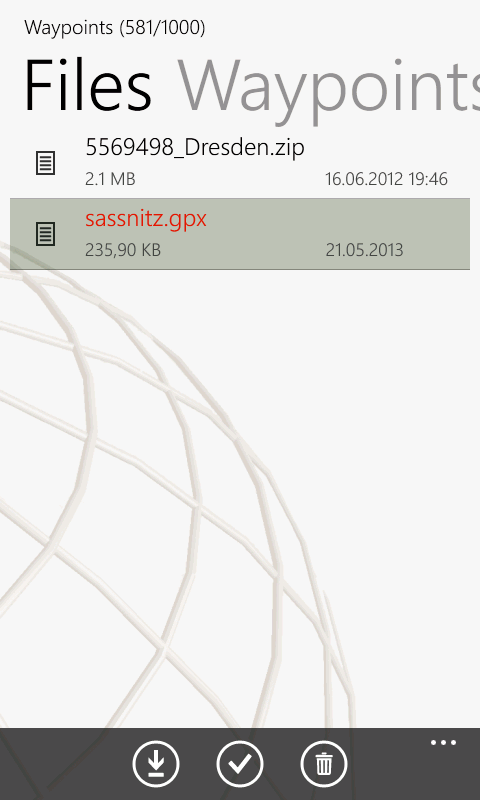 It is very easy to download caches from the map and save them as GPX-file for later offline use. Here is an example workflow how to do this. 1) Move the map to your desired position. In this case ‘Sassnitz’ in the north of east germany on the peninsula Rügen. 2) The center of the map should point to your target position. Press the refresh button to load the caches around this point. 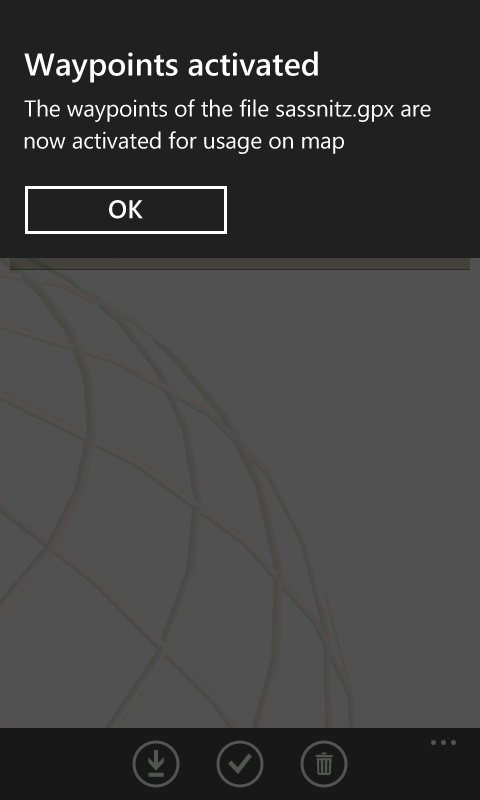 You should have been authorized to geocaching.com before, otherwise view the appropriate HowTo Login to geocaching.com. 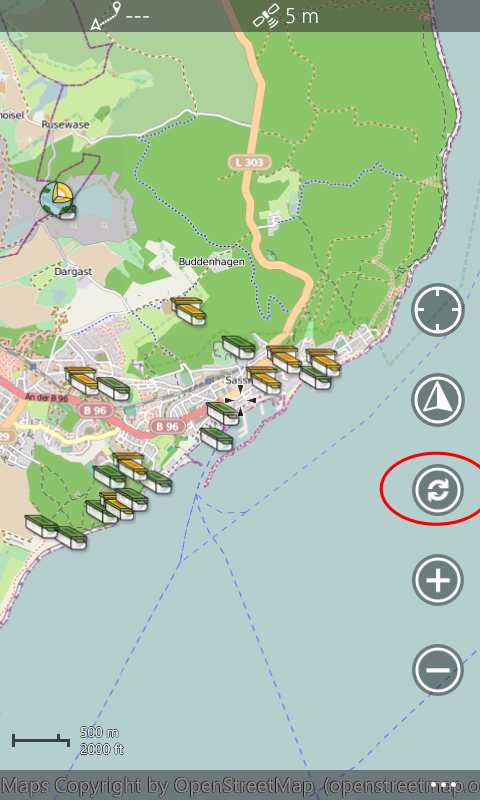 After some seconds the caches according to your filter-criteria are displayed on the map. The filter criteria can be accessed by the Filter-button of the menu. Type in a descriptive name for your download and press the back button once to leave the input box. The checkbox “Download full descriptions” should be selected to download the description text and logs of each cache. 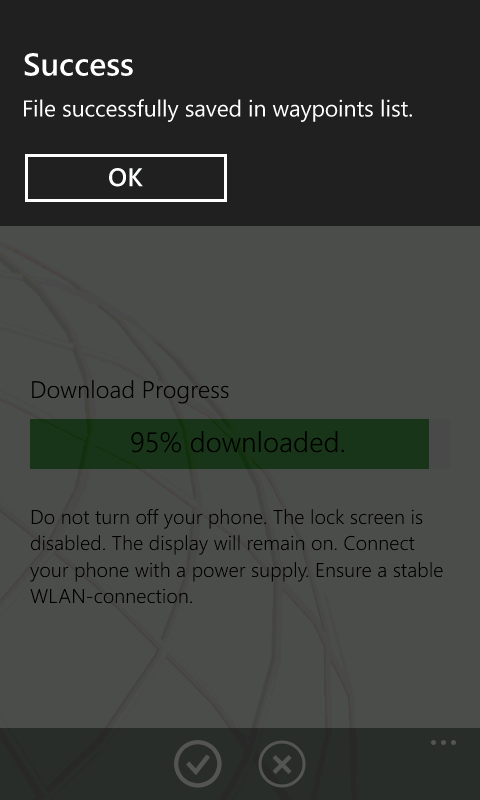 5) Press the Download-button to start the download progress. 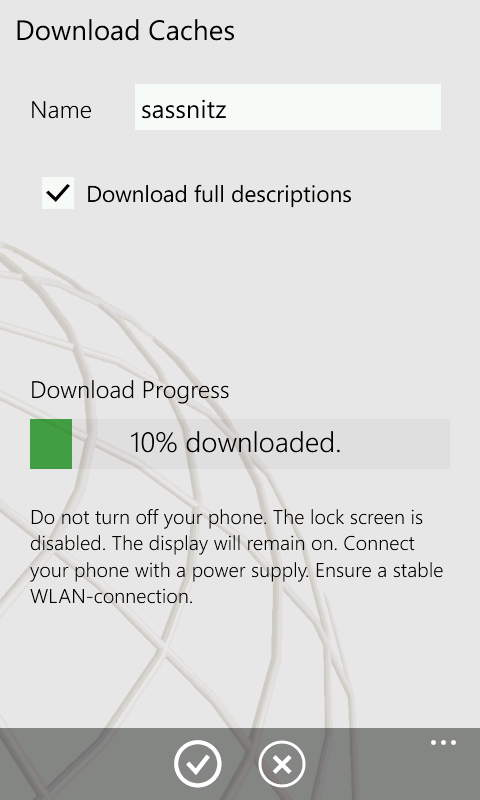 Ensure a stable WLAN-connection and connect your phone to a power supply while long download sessions. After 1-2 minutes the caches should have been downloaded. Now you have one more GPX-file in your Waypoints-file-collection. 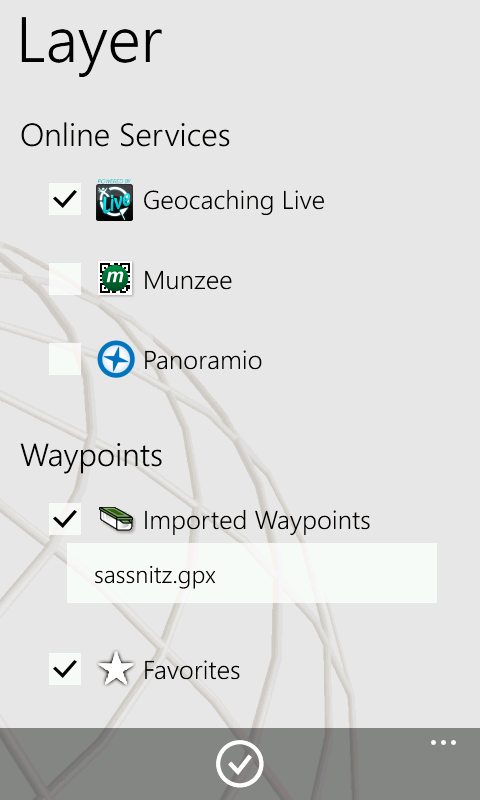 Thats all you have to do to download caches from the map as a new GPX-file for later offline use. Now take a look into your Waypoints-collection. Press the “waypoints…” menu item. 8) Select the GPX-file and press the Activate-button from the menu to activate this file for usage. 9) Swap to the Waypoints-page and you see the list of waypoints ordered by distance. 10) On the Layer-page you can see which Waypoint-file you have activated. 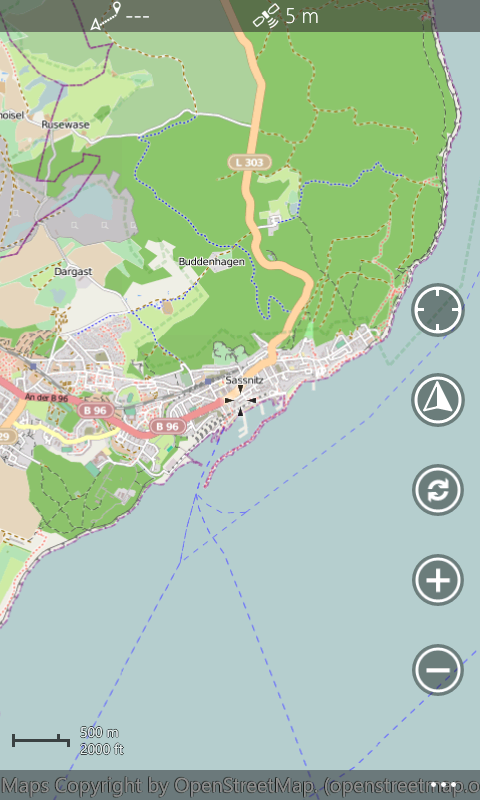 The Layer-page can be opened by a tap on the Layer-button of the the map menu. This entry was posted in Geocaching, HowTo and tagged caches, download, map, save by maaloo7. Bookmark the permalink. Je viens d’acheter l’appli.depuis quelques semaines. Je pratique le Géocaching depuis 2009. Mon smartphone est un Nokia Lumia 920. J ‘ai expérimenté 2 autres appli. avant celle-ci ,et je peux déjà confirmer qu’elle est vraiment “supérieure “à ses rivales, Un gros “Bravo “aux concepteurs pour votre excellent travail. Je viens de voir qu’une nouvelle mise -a-jour est prévue pour Octobre et qu’elle intégrera la carte Here Maps, ça va être encore mieux,parce qu’elle peut “Zoomer”jusqu’à 20 pieds si je ne me trompe. J ‘en profite aussi pour faire une petite suggestion . :dans la recherche “Nearby”,est-ce que c’est possible de le faire par Date ?si oui, je n’ai pas trouver comment faire ,et si non, ,je pense que ça éviterait de toujours afficher celles qu’on n’a pas l’intention de trouver. Hello, I would like to ask if it is possible also to download images – not those in the listing, but in the gallery. I have downloaded full cache descriptions (as a Premium Member) and thought that images had been also downloaded together with cache descriptions, but later when I was looking for the cache in the field (without internet connection) and needed to look up a photohint, the app didn’t show any pictures (saying “No internet connection”) and the link to Gallery was inactive – obviously it works only when online. ‘Thanks’ to that (and OK, it was also my fault that I have not downloaded the images manually.. but I was relying on the app) I did not manage to find the cache, in the location that I probably will never visit again. Thats true, the pictures of downloaded caches are not saved. But if you add a cache to the favorites with pictures in the listing, the pictures are also saved. The pictures from gallery are not saved, because this are a lot of pictures, this would need huge memory space, and the picture in the online view can not be saved. But this would be an idea that this picture is than added to the listing pictures. 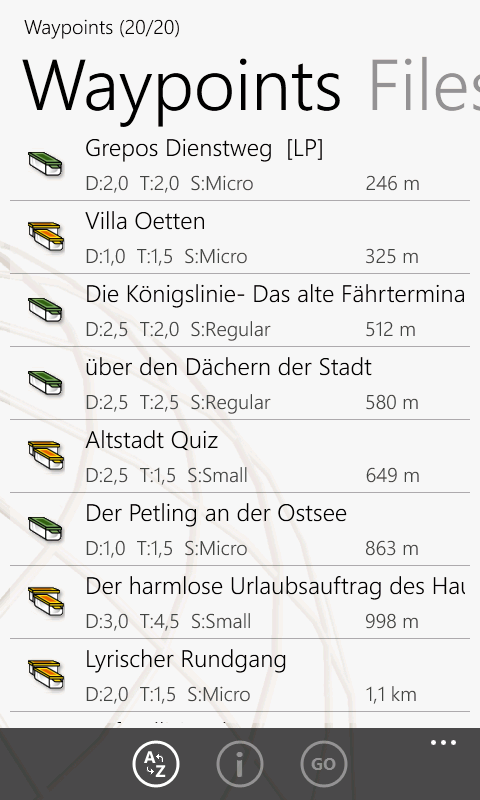 I have marked the point for downloading also the pictures of downloaded caches in my to-do list for the next versions.